Last night influencers along with executives from MasterCard and Evite, joined us for the soft launch of the FX Group marketplace, powered by mCart. FX Group is a creative agency poised to ignite shoppable content in every medium with mCart’s stellar technology. Be among the first to visit and shop the FX Group marketplace now! Lauded by industry insider publications like Fashionista, Apparel Resources, WWD, Fashion News and others we’re thrilled to offer the first marketplace for everyone from micro to mega influencers to use mCarts to make the most of their original content in any medium. mCart leverages AI and blockchain technology to introduce fairness, transparency and speed to maximize the reach of Content Publishers like you, who are truly responsible for influencing shoppers. The mCart platform provides all the necessary tools such as coupon validation, rebate, price drop alerts, look-a-likes, product locator, and over 100 innovative acquisition, retention and monetization features. Each of these features is designed to stop third-party tools publishers from replacing the content publisher’s cookies in the penultimate step, a practice that has contributed to a drastic margin of error in attribution analysis. According to Fox Business, the SEC has announced it will review the decision to reject BTC ETFs. This touches on the topic discussed with Mavatar co-founder and CEO’s Susan Akbarpour on Varney & Co. show two weeks ago. In her segment on the financial show, Susan explained the advantage of utility tokens for the U.S. economy and technology applications and how countries who are dragging their feet on ICO, defining utility tokens and crypto regulations stand to lose out. Switzerland, Poland, Singapore and several other countries already have implemented legislation to categorize cryptocurrencies and to regulate ICOs causing U.S. entrepreneurs and developers to take their enterprises overseas. Read the full Fox Business article here. Menlo Park, CA — August 7, 2018 — mCart by Mavatar today announced that Susan Akbarpour, the companies Co-Founder and CEO has been selected to speak at Digital Marketing Recoded by Impact 18 taking place September 19 -21, 2018 at Aria in Las Vegas, Nevada. At IMPACT18, attendees will learn the best practices and techniques to increase market share and business growth from the industry’s leading experts, explore the latest tools and trends, and network with local and global leaders and professionals. 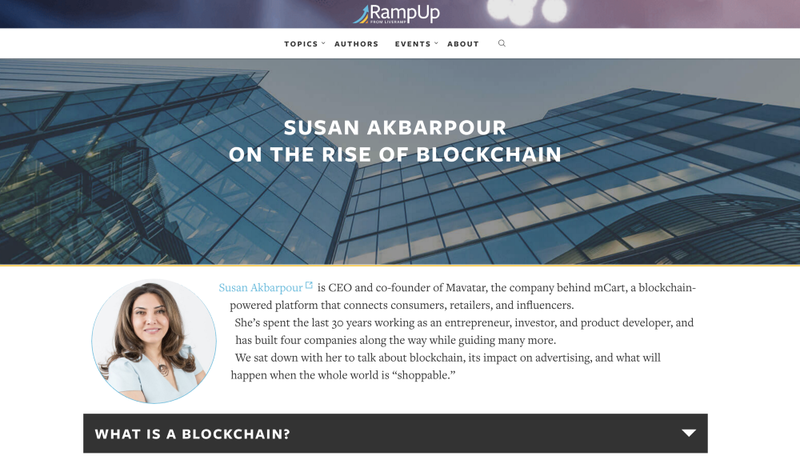 Mavatar CEO Susan Akbarpour speaks at #RampUp Chicago in September. As an expert in blockchain technology and marketing, Susan oversees the strategic and creative direction of mCart by Mavatar. Her brainchild, mCart has gained a significant reception from industry insider publications likeWWD, Fashionista, Apparel Resources, Fashion News Thrive Global and Silicon Valley Review. Susan is a visionary with over 25 years of hands-on experience building and advising successful and innovative products and businesses in technology, media, retail and management consulting. She founded Mavatar soon after receiving her MS in Management from Stanford University in 2010. Throughout her journey as an entrepreneur, journalist, publisher, investor, board member, community advocate and political fundraiser, Susan has received multiple media, community and business awards, spoken at various conferences and is frequently featured in mainstream media. Susan is also a general partner at Candou Ventures, Trustroot advisory board member, founding member of the board of directors at IMA International Executive Council and VOMax Corporation, member of Stanford Business School Alumni Association, Stanford Women On Boards, a prestige member of Watermark, a nonprofit organization that is a community of executive women. mCart by Mavatar leverages AI and blockchain technology to introduce fairness, transparency and speed to maximize the reach of content publishers who are truly responsible for influencing shoppers. The mCart platform provides all the necessary tools such as coupon validation, rebate, price drop alerts, look-a-likes, product locator, and over 100 innovative acquisition, retention and monetization features. On Wednesday, September 19th at Impact18, Susan will speak about how organizational leadership crosses marketing communication as well as the benefits of utilizing blockchain and cryptocurrency in eliminating go-betweens and bottlenecks in marketing. To hear Susan’s panel discussions live, register for Impact 18 here.